My mLearnCon proposal was accepted by the eLearning Guild: Yea! So now the work begins. I had thought to do my talk on a case study but during a chat on Twitter someone suggested a different spin. 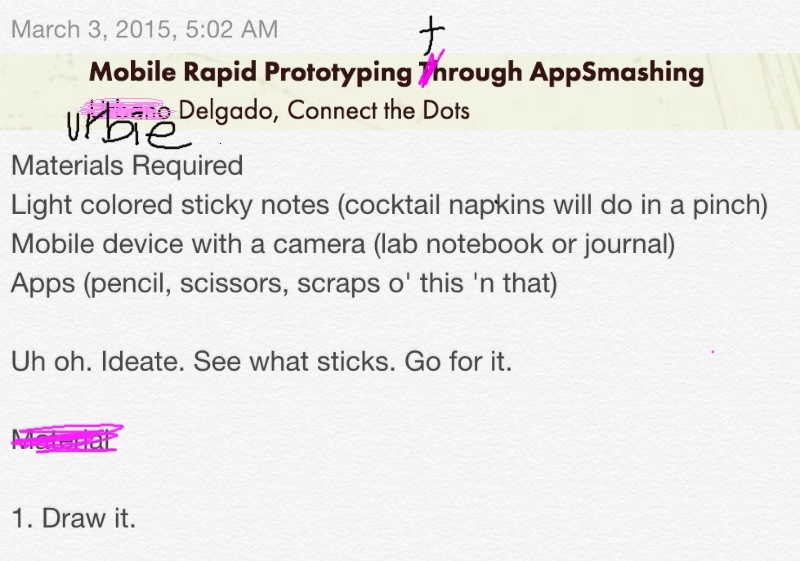 So that's where I'm at now, ideating how it might work. Good things happen, I've found, when you throw ideas out there. This entry was posted in #140WC, continuous improvement, elearning guild, innovate, instructional design, learning activity, learning and development, madwriting, positive deviance, professional development, storytelling, transformational, unordinary and tagged #140WC, collaborative, curiosity, design thinking, devlearn, educational technology, elearning guild, holistic, ignite, imagination, instructional design, learning experience, madwriting, make, positive deviance, professional development, prototype, rhizomatic, rhizome, service thinking, sketch, social media, Storytelling, tinker, training, unordinary by urbie delgado. Bookmark the permalink.